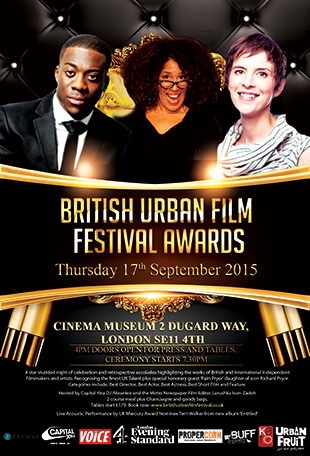 British Urban Film Festival awards ceremony nominees announced! The British Urban Film Festival has announced that comedienne, cabaret performer and daughter of the late Richard Pryor, Rain Pryor, will be in London to receive an honorary award in recognition of her father’s contribution to comedy, film and television at the British Urban Film Festival awards (supported by Channel 4) on Thursday 17 September. For the first time in its 10 year history, the British Urban Film Festival will be recognising actors, actresses, scriptwriters and filmmakers whose work has been showcased by BUFF since the festival was launched in the summer of 2005. The inaugural BUFF Awards will also present emerging talent awards to filmmakers and scriptwriters whose work has featured in this year's British Urban Film Festival which runs from the 17th to the 21st September. Rain Pryor said: “My dad was an icon who changed the face of comedy and shared his deepest truths. It is an honour to accept this award on his behalf, not only because he is my father, but because he created in his children social change and truth."